Sidney Slon/Staff Photographer The Phelps Mansion Museum is hosting candlelight holiday tours every Thursday evening of December. 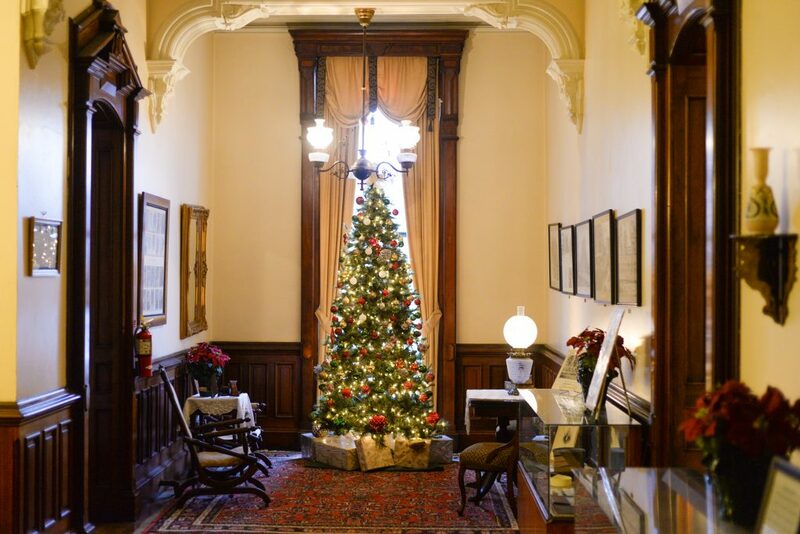 During the month of December, the Phelps Mansion Museum will offer extended hours and special candlelight tours to show off its holiday decor. Built in 1870 for Sherman Phelps, a local business owner and fifth mayor of the city of Binghamton, the house became a meeting space for a private ladies club in 1905. The club added an extension onto the house and furnished it with paintings and decor, most of it from the 19th century. Most mansion tours focus on the story of the Phelps family, with some seasonal variations. The candlelight tours this month are focused on Victorian holiday traditions. According to Joe Schuerch, house manager of the museum, traditions traveled across the sea from England to America, informing the Christmas celebrations of families like the Phelpses. The decorating of the tree, for example, was brought to England from Germany and popularized by Queen Victoria. “Anything Queen Victoria did, people would emulate because you’re supposed to follow by the queen’s example,” Schuerch said. The mansion’s first and second floors are open to tour groups, and most of the rooms have been decorated for the holiday season. There are eight Christmas trees in the house, scattered among the dining rooms, parlor, conservatory, halls and bedrooms. The mantles are draped with garlands and scattered with baubles and angel figures. Schuerch said the use of greenery and natural decorations is true to the period. “The Victorians loved pulling nature in, so they loved pinecones and berries, greeneries and fruits trees,” Schuerch said. Schuerch said that the museum staff tries to stay as historically accurate as possible while taking some creative liberties, working to appeal to visitors while still showing off the design of the house. The tour focuses not only on decor but on the origins of Christmas games, cards and traditional meals, such as turkey and goose. Following in the Victorian custom of telling ghost stories on Christmas Eve, tour guides will tell a ghost story to guests. Year-round, the mansion is strewn with fake plants, birds and plated desserts, meant to exhibit common tastes of the era. There are no ropes barring visitors from the rooms, and most of the mansion can be freely walked through. Schuerch said these details help contribute to a more realistic experience for visitors. Candlelight tours, approximately 50 minutes long, will be offered from 5 p.m. to 9 p.m every Thursday in December. Spots can be reserved via a link on the Phelps Mansion Museum’s Facebook page.